Mile Markers: The Tent Goes Back Up In Richton, Mississippi! We are so glad to be back with Pastor Scott Morris and the folks at Richton First Assembly for our fifth year of tent revival at the Recreation Park in Richton, Mississippi. This is the fourth year using the Blue and White Gospel Tent in Richton and the first year with the expanded 48x92 tent. We are expecting to fill it up again this week. We had some great help at the tent set up Thursday evening! No wonder those stakes went in so fast! The official set up time was 5:00 PM but Bro. Scott told folks that if they could come at 4:00 we would get started laying stuff out. We had several there at 4:00 so by the time 5:00 rolled around the stakes and poles were laid out and the tent was on the ground and laced up. 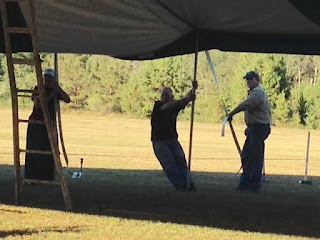 By the time the full crew was on hand it was time to raise the tent in the air. Everyone worked hard and in a little while it was up and ready to tighten. Soon the chairs were going into place. These folks worked so hard and I sure appreciate them doing it. It is hard to believe that just 90 hours before the tent was standing in Wichita, Kansas 900 miles away! But here it is right before bed time Thursday night in Richton, Mississippi! We plan to begin service tonight (Friday) and run through next Friday. Each night will begin at 7:00 PM with the exception of Sunday. The Sunday service is planned for 3:00 in the afternoon. We are anticipating a great move of God so please come and be with us if you can.